Lanez’s upcoming Love Me Now project is due out on October 26. 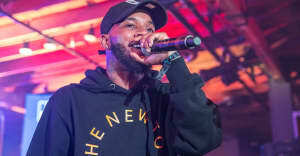 Tory Lanez premiered a new song on Zane Lowe's Beats 1 radio show on Wednesday. The bass-heavy track — titled "Miami" — features buzzing Atlanta rapper Gunna, and precedes the Canadian musician's upcoming Love Me Now project. Speaking to Lowe during the show, Lanez also gave some insight into the tape — which includes a ton of notable features, including Lil Baby, 2 Chainz, A Boogie Wit Da Hoodie, and Trey Songz among others. "My whole thing was just trying into everybody's different lane and just try to be diverse with the features...I wanted to make sure everybody was from everywhere," Lanez said. "It was an all around collaborative project.. It's more like a mixtape to me." Listen to "Miami" below and hear Lanez speak with Zane Lowe above.